Uno dominoes is a blend of the card game Uno and traditional dominoes. The game is played with a special set of 81 Uno dominoes. It may be played by two to six players and is won by the first player to reach 500 points. Mix the dominoes and place them face down on the table. Each player draws six dominoes. Play the double-9 if you have it. If nobody has the double-9, whoever has the double-8 plays it. Otherwise, the person with the double-7 plays, or the double-6, etc. If nobody has a double number, players in turn draw one domino from the draw pile until someone draws and plays a double number domino. Play proceeds clockwise. Play a domino on your turn. You may play on any available end, matching either the number or word, or the color on the end domino. Only the starting double may be played from four directions. All other doubles are placed crosswise and can only be played on by another player on the remaining long side. Draw one domino if you are unable to play. Play the drawn domino if possible. Otherwise, play proceeds to the next player. Say "Uno" when you have only one domino left. If you forget and someone catches you before the next person plays, you must draw two dominoes. Win the round by being first to play all your dominoes. All other players total the points of their remaining dominoes, and the round winner receives those total points. 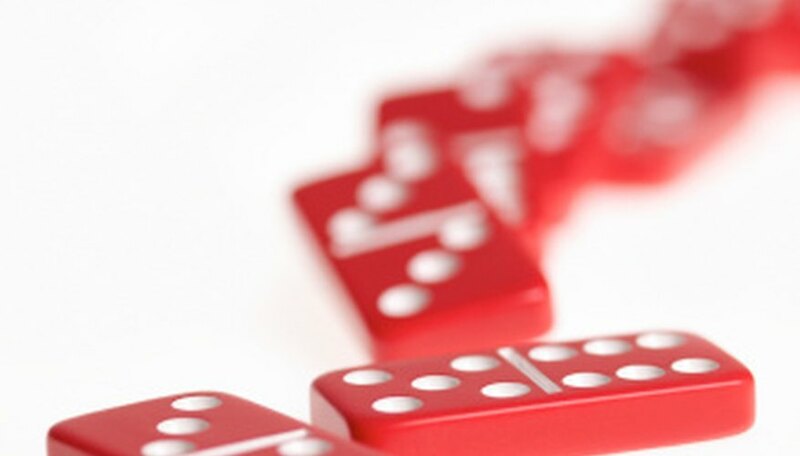 Numbered dominoes score their face values, Draw Two, Reverse, and Skip score 10 points. Wild Draw Four and Dead End score 20 points. Wild scores 25 points. Be sure to count the total points on both ends of each domino. Win the game by being the first player to reach 500 points. Players may agree before the game starts to play to a different total. Special dominoes, when played, result in the following actions: Reverse--if play has been going clockwise, it now changes to counterclockwise, and vice versa; Skip--the next player is skipped; Draw Two--the next player draws two dominoes and does not play any; Wild--matches to any domino, or if played at the open end, its color is decided by the person who plays it; Wild Draw Four--matches to any domino and forces the next player to draw four dominoes and play none, or if played at the open end, its color is decided by the person who plays it (may only be played as a match if the player has no other matching dominoes in his hand); Dead End--no additional dominoes may be played on this domino. Only the end of the domino that is played next to another domino is active. For example, if a green Draw Two domino is matched to any other green domino, the next player must draw two dominoes. However, if the other end of the green Draw Two is matched to a previously played green domino and the Draw Two end is left open, the next player does not draw two dominoes. You may renege on any turn by drawing a domino instead of playing one. You may agree beforehand that all doubles may be played on in all four directions. A player who has a Wild Draw Four played against her may challenge the player who plays it. That person must then show her hand to the challenger. If the player has any other dominoes that could be played, that player instead must draw four dominoes. If all ends are blocked by a Dead End domino, the player who played the last one wins the round. His remaining dominoes are not scored against him. A dead end game may be continued, however, by a player holding the double-Wild. This domino may be played on an open side or end of the starting double.